I hope you all had a great weekend. I have been so behind on blog posts. After our trip last week I just felt so tired! Traveling with a baby is a lot. So I took part of the week to just catch up on everyday things. I love today's simple outfit. This cashmere sweater is my absolute favorite. I also have it in the camel color and I wear it all of the time. In my opinion $98 for a Cashmere sweater is a pretty good deal compared to other cashmere sweaters I have looked at. I went up a size in this sweater so that it would be a little oversized. I also linked a few other sweaters that I am loving. I live in sweaters this time of year and in my opinion Nordstrom has the best selection of sweaters at all different price points. Happy Monday. Thank you so much for stopping by. I love this outfit! Those colors look amazing together! My favorite fall combo. So pretty! What a super cute and comfy casual outfit! You're looking beautiful. I love this outfit! I love that it's super simple but also super cute!! Wow!! I love those layers... so classic! You look great. I really love the simplicity and elegance of this outfit. Love this whole look! The peek of plaid is perfect! 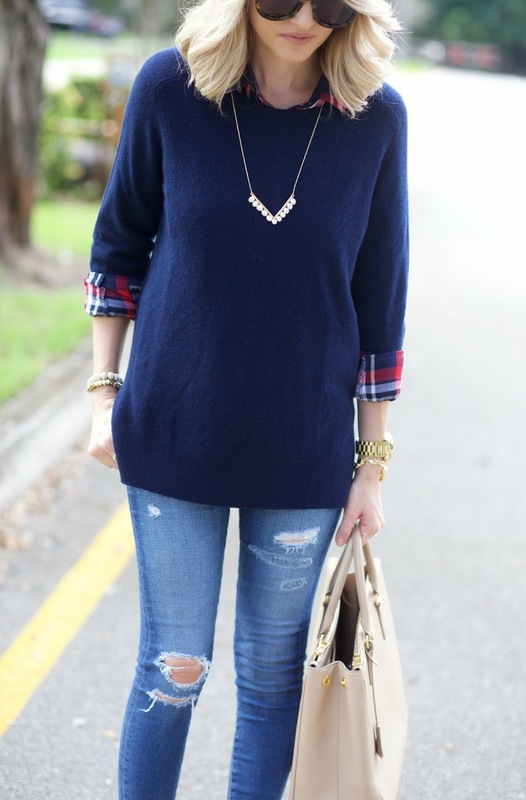 I love how you cuff your sleeves to show the plaid, it's such a great touch for Fall! I love the sweater over a button up look, but I never thought to do it with plaid. So cute!